For us what he meant by this was that we have an academic growth in our formal learning process to become a trainer, a coach or a clinician. We have to know anatomy. We have to know kinesiology, exercise physiology or nutritional systems. Whatever it is you plan to do, please know the science behind it. But then don’t close your ears to the wisdom gained through practical application. That’s the education. That’s the mentorship. That’s getting in the trenches. This is a long one. Would you like to listen to Gray give this lecture? You can hear it free on movementlectures.com, and can download the transcript pdf. You can read books about fighting or shooting a gun, but until you’ve been in a fight or until you’ve missed a target, you really don’t know what you’re talking about in either of those disciplines. There’s a practical application that cannot be delivered via a lecture or demonstration. At some point, your sleeves go up. You have to get your hands dirty. You have to risk the embarrassment of making a mistake when you’re the only one to blame. I want to start this discussion by saying it’s very important to make sure your information is credible, that you’ve done your research and you’re not just working from a dogmatic approach. Make sure what you’re doing, what you’re talking about, what you’re demonstrating and teaching have merit. Your work needs to have scientific merit and academic merit. Once you feel very comfortable with the merit, you need to figure out your style, your attributes, weaknesses and limitations in delivering that information in teaching, coaching, training and rehabilitation. You need to turn that information into valuable action your consumers, customers and patients will appreciate. I’m always learning new things. In my late 30s, I first discovered a kettlebell. Within a couple of years of that strength coaching discover, as a physical therapist I also discovered dry needling. Both of these tools are somewhat unorthodox. I came up through conventional strength and conditioning as an Olympic weightlifting coach using more of the straight-bar lifts, but I’ve always appreciated what a dumbbell can do. A dumbbell offloads one side of the body and gives a unilateral appraisal. When you do snatches and cleans with a dumbbell, I can really see if your body is balanced or not. You must realize the potential I saw when first introduced to kettlebells. I wasn’t just thinking about curls and triceps presses. I was thinking, ‘Man, this thing is made to fly through the air faster than a dumbbell.’ It has some of the same weight, but the grip is probably more structurally sound to protect the wrists. I don’t train weightlifters, although I’ve worked with a lot of them. I train and rehabilitate people who are in everyday life. I also train and rehabilitate people who are famous…professional athletes or whomever. The whole point of lifting weights is not to lift the weight. It’s to force stress into a movement pattern to foster and start a certain degree of adaptability that will prove beneficial in the primary goal,. That goal is not just to get stronger. It’s to move better and move longer, more proficiently and more accurately. The kettlebell was first looked at as unconventional. Then, we found the history of the kettlebell goes back further than either the straight bar or the dumbbell. Boom! My schooling up to that point had taught me that the conventional straight bar or dumbbell free weight approach was all that there was. But I didn’t just read about kettlebells. I put myself through a gauntlet. I stood in front of some coaches who tore me apart, put me back together and helped me appreciate an entirely different approach to strength and conditioning. Then, dry needling saved my hands and really accelerated some of my effectiveness with soft tissue. These are just two things that at one point in my career, my schooling suggested were unconventional, unproven and highly unorthodox. Yet, both of these things are valuable assets to the work I now do every day. Sometimes I can accomplish more in less time with the kettlebell. In treatment dealing with soft tissue, I can accomplish more things in less time with dry needling. This means using some acupuncture equipment to deal with trigger points in different myofascial systems to make a compelling change in movement. I talked with Edo Zylstra about this in depth in our dry needling lecture on movementlectures.com. My schooling taught me one thing and my education taught me another. But to get that education, I had to step out of my comfort zone. I had to admit I knew nothing about these two disciplines, even though I had a background in both rehabilitation and in strength and conditioning. The new tools commanded my attention and my respect. I didn’t get into lengthy discussions about the effectiveness of dry needling in physical therapy or the effectiveness of kettlebells in strength and conditioning until I first held certifications in both of these disciplines. Someone certified in dry needling discussing the limitations or attributes of it, probably makes a little bit more objective sense than somebody who has something to gain by seeing this model taken down a notch. I’m sure there’s something else to sell you around the corner. We’ve been uncovering a lot of new information since first introducing movement screening and movement assessment. As a matter of fact, some of the most compelling things we’ve seen in sports medicine, orthopedics, fitness and strength and conditioning is that on the standard operating procedure landscape, we’re somewhat ineffective, inconsistent and not highly evolved. You’ve heard me talk about the evolution of what happens in the cockpit of a plane before takeoff—the mind-numbing standard operating procedure we ask our pilots to go through every time. The mistakes that cost lives, equipment and time are usually the simple, little things, and not the big things that require a lot of intelligent processing. We always want somebody to default to their training and expertise for the big decisions, but we also realize many decisions in professional conduct are of a breach of standard operating procedure, which was designed to protect us but not to limit us. We’ve often referred to the Functional Movement Screen as something we’d like to see become standard operating procedure…until something better comes along to replace it. What it does is keep us from putting fitness on dysfunction, and it keeps us from trying to bring a fitness solution to a medical problem. Yes, a screen that can be conducted by a non-medical professional can actually indicate whether or not a medical professional needs to be involved. Likewise, medical professionals need to conduct screening at the end of rehabilitation to make sure the rehabilitation is fully complete. If there is a limitation that can be handled in a normal fitness or strength and conditioning environment, this is the methodology and recipe to do that. When we first introduced this screen, we weren’t trying to champion standard operating procedure. We were simply trying to raise the bar of effectiveness. If you don’t think we need to raise the bar of effectiveness, realize that over the last 30 years, we’ve become more obese even though our country probably spends more resources on dietary information and exercise than any other country. We’ve barely put a dent in unnecessary injuries high school students, college students, professional athletes and weekend warriors sustain largely because in orthopedics, we don’t look for predictive value. We don’t look for preventive screening. We wait until you have a problem, work backward and try to determine what caused it. The advances we’ve made in early detection with breast cancer, prostate cancer and diabetes aren’t because our new treatment methodologies are so good. It’s because early detection is so efficient. We need early detection at the fitness level because many clients have been injured and have learned to compensate. Or perhaps they’ve been the victims of unsuccessful and incomplete rehabilitation. Many people think the knee is supposed to hurt when they do things, and think ibuprofen is a breakfast food. They just cover up the pain, not knowing they’re ruining their internal organs with medications to get out of knee pain that could easily be avoided by improving ankle mobility and hip stability. Here’s the thing I want to say about standard operating procedure and what I want you to take away from this. Your schooling and your education brought you to a path—you arrive in that path saying, ‘You know what? I like kettlebells,’ ‘I like dry needling,’ ‘I really like Pilates mat work,’ ‘I really like deadlifting,’ or, ‘I really like barefoot running.’ Before you form an opinion about something that’s going to become standard operating procedure with the way you teach it, the way you train it and the way you rehabilitate it, remember that standard operating procedure is not taught. It is drilled. That’s right. It’s drilled. We map out the route of a fire drill, but when it’s time, we don’t debate the route and we don’t question it. We execute the route in a timely and efficient fashion, always trying to do it cleaner and better. One of the things people in my position have to tell the people who follow our work and who lean on us for education and insight is that by the time we make it to our age, we’ve made a lot of mistakes we wish we could take back. The mistakes make have gotten us here, but that doesn’t mean you have to make those mistakes. What I would love you to take away from this is that you’re not drilling enough. You’re doing a great job with the debate. I look at some of the disgruntled people talking and questioning; I see the products purchased and the learning going on. The scholastic part is there for you. Just make sure that it’s well-referenced and valid. Then, spend more time in the trenches. Spend more time getting practical. Make mistakes, but don’t make really big mistakes. Do things that are safe. Try them on yourself first. Try them with a training partner, a peer or a colleague first, and then think about bringing it into your professional practice. Drill things. Drilling means there’s a standard operating procedure of doing a certain thing where you put yourself up to criticism, scrutiny and learn from it. How do we drill corrective exercise? Well, we have a little thing called the Functional Movement Screen. Do you think you know the movement screen? All right, you just did a movement screen and you found an asymmetry on the active straight leg raise. If you’re pretty sure you know the corrective exercise that will change the asymmetry in this situation considering the other tests in the movement screen, execute your corrective strategy. Make sure you do it correctly. Teach it in an effective amount of time over one session or multiple sessions, but always test so you have feedback. The whole standard operating procedure with the Functional Movement Screen is mostly designed for the user—not the recipient of the movement screen. This is because it dials you in. Not only do you get to drill your corrective strategy effectiveness, you get pretty quick feedback on if you made a difference. If your attempt in correcting a movement pattern is ineffective, you have to ask yourself two questions. Did I execute the corrective strategy right or did I execute the right corrective strategy? The first can easily be done by getting next to somebody who’s more proficient than you, and also by listening to all the rules of what’s supposed to go down in the exercise. The second can be accomplished by making sure you’re proficient with the movement screen. In our workshops, people are very focused on the corrective part we discuss the second day of a FMS workshop—so much so, they forget everything they learned the first day. In my parting comments to the newly indoctrinated Functional Movement Screening class, I remind them to go do 20 screens. Don’t ask people to pay for them because you’re not that good yet. As a matter of fact, don’t do them on people who need you. Do them on people who will tolerate you, meaning your family, friends or coworkers. You have 20 screens you need to do with no obligation to fix what you find. Here’s the beautiful thing that happens. You start doing movement screens as a cold technician, no more passionate about doing movement screens than you would be taking blood pressure. Your subconscious mind starts to pick up what you know. Twenty screens in, you’ve had an opportunity to see patterns repeat themselves. Or you discover shortcomings where your description or test instruction isn’t adequate, and you have to go back and become a better communicator. All of these things happen on the first 20 screens, which becomes my advice. Drill it. Drill it. Drill it. Learn the chords. Then play the song. I want to give you this advice. There’s no obligation for anyone who’s had our certification or education to correct anything until they’re reliable, consistent, effective and confident doing the screen. You’ve laid down the test-retest scenario. You know you’re effective at marking what’s dysfunction and what’s maybe just a little imperfect. You can now apply your corrective strategy. The credit goes back to Mark Twain: Don’t let your schooling interfere with your education. Get your schooling. But your education doesn’t stop there. Your education is about practice. It’s about humbling yourself and learning more. Don’t form an opinion until you’ve drilled something to the point where you realize it’s ineffective and inefficient or it’s absolutely what you should start doing. You don’t learn standard operating procedure. You drill it. 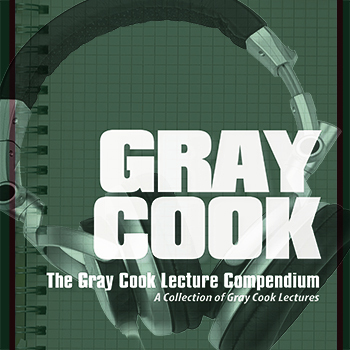 Would you like to listen to Gray give this lecture? You can hear it free on movementlectures.com, and can download the transcript pdf. Gray. I really enjoy how you deliver and share information. You truly ‘share’ information. You obviously have great education and experience but you offer your findings in a humble and logical manner. Thank you for your insight on education and learning as a journey & as a life experience, not as a destination.